Statistics are often seen as simple, straightforward, and objective descriptions of society. However, what we choose to count, what we choose not to count, who does the counting, and the categories and values we choose to apply when counting, matter. 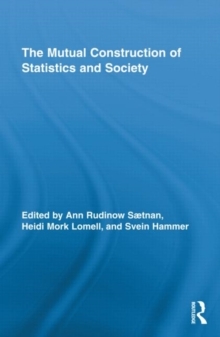 This volume addresses the ways in which statistics and numbers are gathered and applied in social science research. The contributors argue that we must become more aware of the power and the limitations of statistics. Learning statistics needs to be about more than simply mastering the techniques of using the tool; it needs to also be about learning the dangers of that tool and learning to control it within social and ethical bounds. These dangers lie in the routines through which statistics are applied; the discourses from which they emerge and into which they are deployed; the power relations created by those discourses; and the assumptions, meanings, and categories statistics carry with them in those discourses. This volume will be necessary reading for students and scholars using quantitative data within the social sciences.